This package contains both the antenna and adapter cables needed to add a higher performance external antenna to your AT&T Unite mobile hotspot, Sierra Wireless Aircard 770S Mobile Hotspot. This package is designed around the Panorama LTE/Mobile Broadband Portable MiMo Antenna which is the the perfect solution for portable use where a fixed mount antenna is not possible. The stylish form hides a powerful and effective antenna designed to significantly improve signal strength and transfer speeds for data connections. The DMM-7-27 Supports MiMo & Diversity across 2G/3G/4G platforms. The Panorama DMM-7-27 contains two omni-directional ultra wideband elements with separate FME connectors which makes it ideal for connecting to devices with 2 antenna ports like the AT&T Unite. 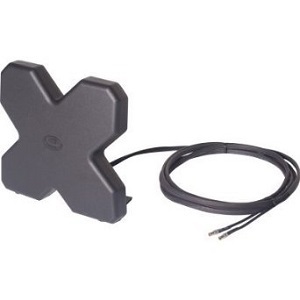 The antenna comes with fold out feet, suction cups and clips for various mounting options. Length x Width 5.47" x 5.94"